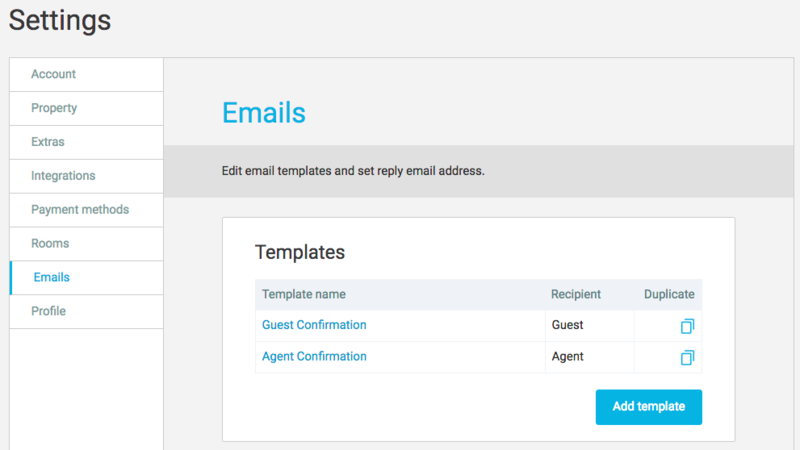 You can personalise the email templates for guest and agent emails with your own wordings and policies. To do this, head to Setting > Emails. Click on Add template to start adding a new personalised template. You'll need to specify if the template is used for Guests or Agents. Use this option if you want to make a different version of your template. Click on the icon in the 'Duplicate' column for the template you want to duplicate. This will create a copy, which you can personalise. Make sure you save the template. Click on the email template name that you want to personalise. The editor allows you to style and your emails. Use data tags to automatically fill information captured from the booking. Inserting images/logos: The editor doesn't compress or resize the image. Make sure your images are optimised for email and try to keep the file size below 50kb. The bigger the file size, the longer the email will take to load.